Happy Veteran’s Day! St. Anthony of Padua Grade School would like to offer our love, thanks, and gratitude to all of our parents, grandparents, family, and friends who faithfully and dutifully serve or have served in our military. We are forever grateful for your selflessness and courage. Thank you to Mr. Thomas Spencer, who is currently serving in the Army as a First Sergeant and his father, Mr. Tom Spencer, who is a retired Green Beret in the Army. They came out to school today to talk to the Middle School about their experiences. This week at St. Anthony’s and throughout the Diocese of Wilmington, we celebrated Vocations Week. We started our week by having two guest speakers. On Monday, our very own Father Nick spoke with the 6th grade, to prepare them for their visit to Holy Cross in Dover on Wednesday. I missed his presentation but heard excellent feedback from the students. They asked their pastor very thought-provoking questions. 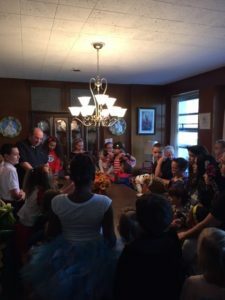 They enjoyed the time spent with him and the fact that Father Nick was comfortable sharing his personal thoughts and opinions with them. Father Brian Zumbrum from Salesianum (formerly of Nativity Prep) met with the 7th and 8th-grade classes. I had the pleasure of sitting in on his presentations. He did a beautiful talk about his unusual journey to the priesthood. He compared himself (a very young priest) to a baby panda. He claimed that pandas (like priests) are becoming extinct. When a new panda is born, everyone is excited to have new blood. He spoke openly and honestly about his journey from Catholicism to being Agnostic, and to finding himself as a student at an Oblate college, DeSales University. Prior to attending that “Catholic” college (he went solely because it was a free ride), he had never even heard of the Oblates. Now they are his family and friends for life. His message was very simple. He told the students they were already in their vocation process/journey. He didn’t speak simply of the three choices people often discuss; married life, single life, and religious life. He talked about choosing whatever it is in life that will find you joy. He urged them to not look at the price tags of high schools and assume the highest price means it is the best fit for you. Father Brian also told them to appreciate the fact that you can find your happiest moments in something like service work. He spoke of his many service experiences and about his brief 48 hours pretending to be homeless for a college social experiment. The children were stunned to hear how horribly he was treated and how much he learned on the streets for his brief, but enlightening two days. He admitted that he lasted only 23 hours before he broke down in tears to a police officer. He had been ignored and treated horribly. As a young college student (with a 4.0 GPA) pretending to be homeless, people were terrified of him, mean to him, and frequently asked him if he was a drug addict. He met several very nice young men and women who were homeless simply because their parents had kicked them out on the streets or could no longer care for them. He talked to them about the fact that he is more comfortable on the East side of Wilmington than North Wilmington, because he has met so many people in his community service work. He talked to them about things they will most likely never experience in a lifetime. His goal was to tell them to find joy in their life and not to “block God’s blessings.” The children in both classes asked very thought-provoking questions and kept him past the 45 minute class period. He shared his experiences of meeting the last 3 Popes and how he believes every day that God has him right where he needs to be. He has experienced sad times like the death of a student by gun shot in Wilmington and being with many people as they breathe their last breath. However, at the end of each day, he can say that his work gives him great joy. He emphasized looking for joy in your life. He is thankful to have worked as a teacher and vice principal, and currently is in school ministry at Salesianum, Nativity Prep, and the University of Delaware. As this week comes to an end, I ask for prayers for each and every one of us in our vocation and for our students in their vocation journey. Please pray for all of our religious who are our role models for spirituality, mercy, and gentle strength; for a growth and strength in their ministry. Please pray for all those people who choose the single life, including our amazing parish trustees, Anthony Albence and Anthony Frabizzio, who live the vocation of single life so beautifully in service throughout our parish. I ask that you pray for all of us in the vocation of marriage, in a time when married life is not always valued as it was in the past. Finally, in this month of “peace” in our school, let us continue to pray for love, peace, joy, patience, kindness, generosity, faithfulness, gentleness, and self-control in our communities, in our local and federal government, and in our personal lives. Let us all be examples of the Fruits of the Holy Spirit for others in the world. 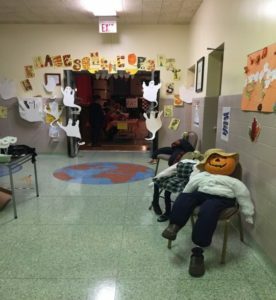 Halloween Party Success – Thank you to our Home and School Board for another amazing Halloween Party this year. People of all ages had a blast! Games were new and exciting. The haunted house was well done. My only complaint was being tricked to go through there not knowing I would have to crawl. Fortunately, being muscularly dressed as my favorite superhero Captain America, this proved to be no challenge whatsoever. 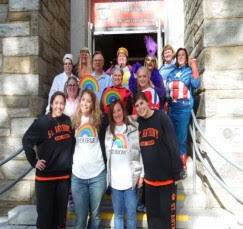 And in school on Halloween, the students and some teachers and staff dressed up for Halloween and had a terrific day. 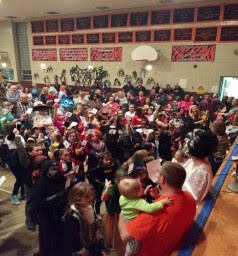 Preschool and 4th Grade visited the Rectory, showed off their costumes, and received candy from Father Nick and staff. Preschool also sang some Halloween songs towards the end of the day. 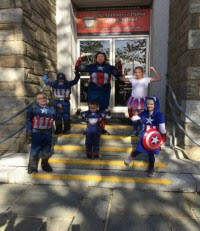 Here is a picture of my fellow Captain America superheroes and my crazy staff. We had a great day! Designer Bag Bingo – On Sunday, our Home and School Association will be holding its Fall Designer Bag Bingo. This is a fun event and a great fundraiser! I had plans to attend this lovely event, but I will now be celebrating Nick Mercantini’s birthday at A.I. DuPont with his 8th Grade class. I hope the event is as successful and fun as it was last year. I am sorry I will miss it. Box Tops for Education – Thank you so much to all of our parents who diligently cut out Box Tops for our school. This program earns almost $1000 a year. Most recently, we received a check for almost $500. 8th Grade was first place in this collection and won a breakfast and Pajama Day. 4th and 5th Grades tied for second place. Each class won an ice cream party! Many thanks for taking the time to cut out the little ten cent papers. They obviously add up! Reminder – Noon Dismissal on November 16th –Students will have a noon dismissal on Wednesday, November 16th for faculty and staff Professional Development. Thanksgiving Food Drive –Student Council is having a Thanksgiving Food Drive which will support the St. Patrick Center and the St. Anthony’s Christmas Basket Fund. Each grade is asked to donate a specific item. This year, we have grouped Church Buddies together so both classes will be collecting the same item. All items must be in the morning of Friday, November 18th. The class with the most items collected will receive a Pajama Day with doughnuts and hot chocolate. Thank you in advance for your generosity! Holiday Event at Barnes & Noble and Grub Burger – St. Anthony of Padua Grade School is holding a fundraiser on Tuesday, November 29th at both Barnes & Noble on Concord Pike and Grub Burger located in Concord Mall. Our school will receive a portion of the proceeds from all purchases that night. Come out and enjoy a delicious meal, buy some books, and support our school. We hope to see you there! The event at Grub Burger is all day. Flyers will be handed out in school on Monday, November 28th. Please turn it in when you place your order. You can also mention St. Anthony’s School when you order if you do not have a flyer. The event at Barnes & Noble is also all day. Teachers and staff will be at the store from 4:00 – 7:00 P.M. to greet and wrap any Christmas presents you might purchase. Our Antonians will be singing at 5:30 P.M. in the Children’s Section of the store. Flyers for Barnes & Noble will be handed out in school on Monday, November 28th. (Please note that online orders can be placed from November 29th through December 3rd using book fair ID 11714888.) Thank you for your support! Santa’s Secret Shop – This annual shopping event put on by the Home and School Association will be held on Tuesday, December 6th and Wednesday, December 7th in the Library. Students will be able to shop for their family and friends here at school during a selected time. More information will be coming home as the date gets closer. First Reconciliation – Our 2nd Graders will receive the Sacrament of First Reconciliation next Wednesday, November 16th. Please keep them in your prayers as they receive this special Sacrament. They are so proud of what they have learned and the fact that they are choosing this Sacrament for themselves. Annual Home and School Turkey Luncheon – On Tuesday, November 22nd, the school will be celebrating Thanksgiving during all lunches. The Home and School Association, Board members, and other parents serve all students, faculty, and staff a delicious turkey lunch on this day. Our students look forward to it every year. If you are able to help with set-up, serving, or cleaning, please go to http://www.signupgenius.com/go/10c0c4ba9a72caa8-thanksgiving1 to sign-up for a time. Sunday, November 13th – Home and School Designer Bag Bingo – Gym – 2:00 P.M.
Monday, November 14th – Confirmation Meeting – Ballad Room – 6:15 P.M.
First Reconciliation – Church – 6:30 P.M.
Monday, November 21st – 1st Grade Field Trip – Hagley– 9:00 A.M. – 12:00 P.M.
November 28th – Advent Prayer Service – Lobby – 8:00 A.M.
Student Council Meeting – Preschool Room – 3:00 – 3:30 P.M.
November 29th – 5th Grade Field Trip – Franklin Institute – 8:45 A.M.- 2:15 P.M.
Barnes & Noble Night –Concord Pike – 4:00 – 7:00 P.M.
November 30th – Home and School General Meeting – Ballad Room – 6:30 P.M.
December 5th – Advent Prayer Service – Lobby – 8:00 A.M.
3rd Grade Field Trip – George Read House – 8:45 – 11:45 A.M.
December 8th – Immaculate Conception Mass – Church – 8:00 A.M.
December 9th – 6th/7th Grade Field Trip – Dickinson High School –9:30 A.M. – 12:30 P.M.
December 10th – Confirmation – Church – 10:00 A.M.
December 11th – Breakfast with Santa – Ballad Room – 8:00 A.M. – 12:00 P.M.